The excavator tricks we see on the internet that would normally impress us have now been made to look like mere child's play compared to the trick you are about to see. Self loading into a dump truck was cool, but it appears as though people have elevated their game. 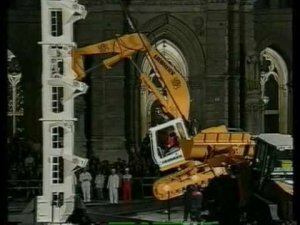 This trick did require that a special tower be built, but other than that it appears to be a stock excavator. You will notice the operator uses the bucket locking pins on the boom and the attachment pins between the tracks to hold on to the tower as he makes his climb; this really shows how strong these attachment points are. An excavator climbs on a specially made platform structure all the way to the top.